Refer here to learn how to effectively use items obtained from boxes while racing in KartRider Dash - social browser game. To enable Item Mode, you need to select the "Items" mode before starting a race. Hit the [Ctrl] or [>] Keys to use usable items you currently have. - Sends unlucky riders slipping and sliding. - Drop on tight spaces or corners for better success rate. hidden behind the box. You can also drop it before getting a box to prevent players on getting items. - When an enemy is directly behind you, drop it to secure your place. - Place it on ramps to make your enemies fall! - Submerge it into waters to hide them! - Targets and attacks the rider in the front. line turns red!. Also available in the item practice mode. - To avoid this attack, you need to lose your opponent's line of sight! - Fires an explosive water bubble that trap nearby riders. splash. Also available in the item practice mode. 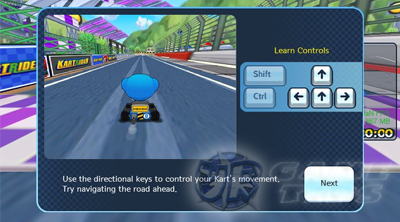 - You can escape a Water Bomb by pressing the directional keys rapidly. 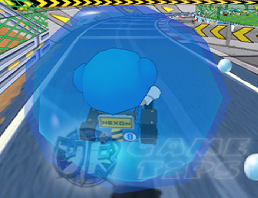 - Traps the rider directly ahead in a water bubble. attack that can target riders even if you can't see them or far away from you! - You can escape a Water Wisp by pressing the directional keys rapidly. - Gives all teammates a Shield. - See Shield (defense item) below for more information. - Knocks the Spaceship off of your teammate. - This is the only way to remove the spaceship debuff. - Also see Spaceship (debuff item) for more information. - Momentarily protects your Kart from an attack. your way, press the fire key quickly!. Also available in the item practice mode. targeting you. 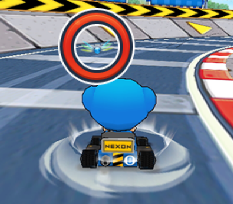 Note that you can only block targeting items like Water Wisps and Homing Missiles. - If you are in the lead, collect Shield to secure your place! - Quickly pulls you up to the rider you target. turns red! Also available in the item practice mode. - Momentarily increases your Kart's speed. - Best used at straight line tracks. - Use it to quickly recover your speed whenever you get slowed down. - Gives you a bigger boost of Nitro. - See Nitro above for more information. - Creates a sight-blocking cloud on the track. - Drop on tight spaces or before sharp corners for better success rate. - If you are in the lead, drop it off right before an obstacle to trap your opponents! - Switches the directional keys of riders ahead of you. - Left becomes right and vice versa. Your teammates will not be affected. - Steer the opposite direction to keep your course. Also available in the item practice mode. - Temporarily slows down the rider in the first place. 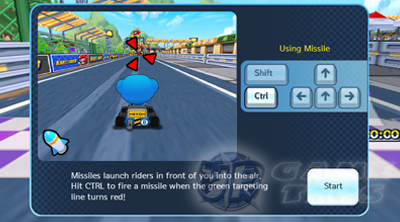 - Use Nitros to recover your speed!